One of the biggest benefits of commercial real estate investments is that assets are generally secured by leases that provide a regular income stream. The revenue created by those leases may allow you to leverage your asset with favorable financing, thereby multiplying your equity over an extended period of time. 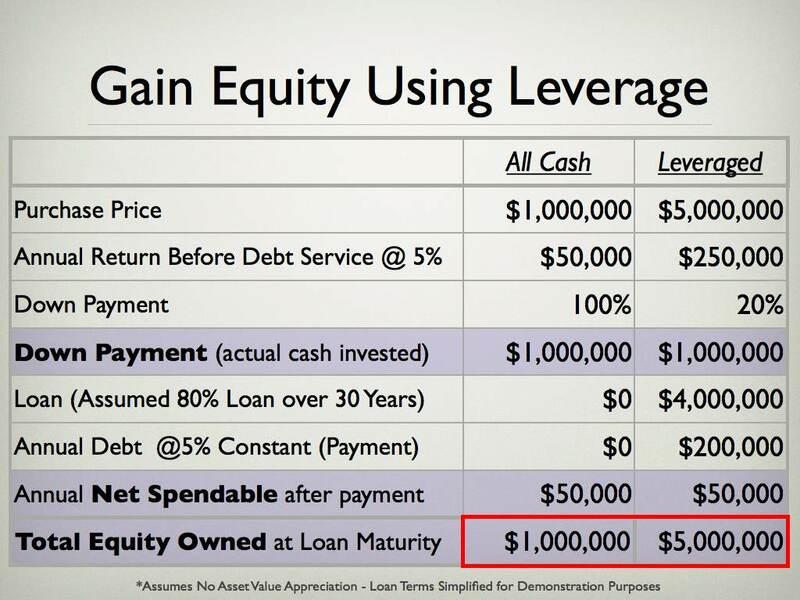 In the example below, the same $1,000,000 initial cash investment yields the same current income, but produces 5X the equity owned at the loan maturity (30 year loan term) utilizing leverage and assuming no appreciation in asset value. Of course, once the loan is paid off, not only has your equity multiplied five times over, but your income also multiplies ($250,000 versus $50,000). Commercial Real Estate is one of the few asset classes that allow you to utilize leverage with a high level of flexibility and security. Click to learn more about the benefits of commercial real estate investing.